Catch my interview on Tuesday 29th January 2019! Imagine opening the gates to your INFINITE divine STRENGTH and POWER. Imagine the feeling of confidence and completeness when you can relish being WHO YOU ARE and create a life full of LOVE, JOY and ABUNDANCE. Imagine being able to shine Your Divine Light to help create a loving and harmonious world for all! Join me on Your Divine Uniqueness and let your LIGHT SHINE! Something inside you wants to find peace, to heal, to find and embody your own truth. Something inside you wants to expand, to become, to share that which is Divinely and Uniquely You with the world. Yet there’s a gap between where you are and where you want to be. I’m going to be taking questions from live callers and sharing a special gong sound bath activation and I’d love you to receive the empowering transmission! Register Here Now! It's free! 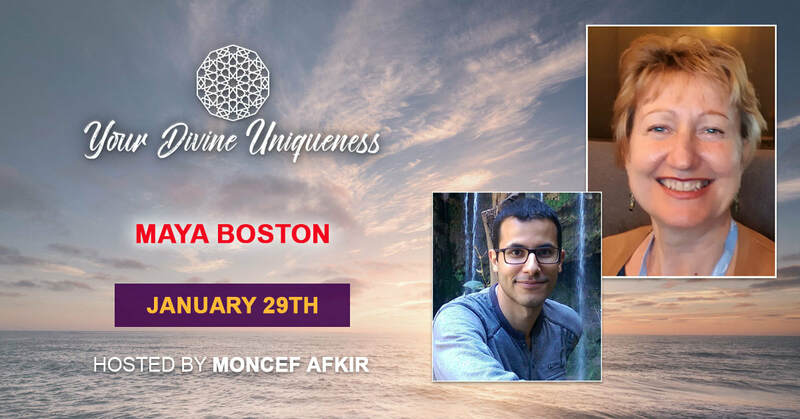 "I love the gentle and yet powerful energy and message that Maya Boston brings... to help us remember the multi-dimensional nature of our being, and reconnect to ourselves, others and our galactic families. She talked about Lemuria, and the message & healing she channels from her past life as the priestess Alel’ha in Lemuria. Learn about the teaching of the circle of Oneness, and how we can bring again Lemuria's essence to our world, and remember what we forgot... that we are one with Creator, with each other and with everything.